I'm not what you might call an X-Men fan. I've only ever read a handful of stories. And there are only really two that resonate with me. 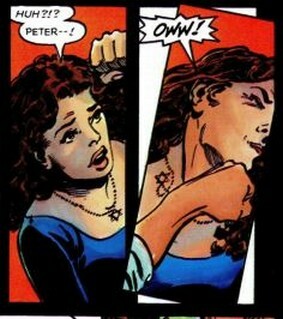 One of them, The Dark Phoenix Saga, is a story I read when I was very young. The other is one I only read around ten years ago, in my mid-20s. And I think it's telling that decades after it was released, and even today, it's just as relevant as ever. 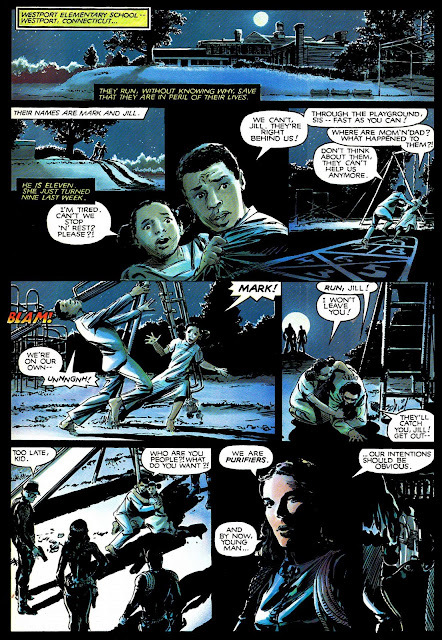 Chris Claremont and Brent Anderson start of God Loves, Man Kills with an all-too-realistic scene of two black children getting brutally murdered in a public place. The perpetrators call themselves The Purifiers, and their mission is simple: to cleanse the world of mutants. They're working for Reverend Stryker, so their justification is a simple one: God wants mutants dead. The word they pin on the deceased is "mutie," the slur used to disparage and demonize mutantkind. But even if this is an allegory, it still looks familiar in today's society. Whatever the reasons, the generalization of a whole group of people and the indiscriminate extermination of them is still a present-day problem, and God Loves, Man Kills, which was published in 1982, still captures that relevance and urgency. 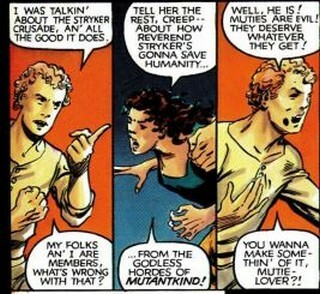 After Magneto shows up and condemns the Purifiers, Kitty Pryde mixes it up with a young man who sides with Reverend Stryker and his cause. Stevie pulls Kitty off him, and tells her to pay it no mind, and that's when allegorical and real-life discrimination intersect. Digression: Can I say I really like what Anderson does here? The slanted second panel expresses that there was an impact, and it also lets him show more of Kitty than a straight-up panel would have. Simple, but effective. 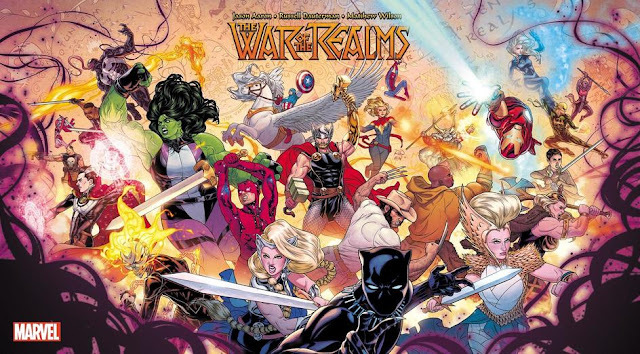 Ultimately, I actually think there's a lot of "fat" in the middle of God Loves, Man Kills, a lot of contriving to get from Point A to Point B, and a lot of Magneto trying to convince the X-Men that his way — treating humans the way they treat mutants — is the right way. (Spoiler: it's not. It never is. It never will be.) But it's well-drawn, well-executed, and the fact that it kinda drags doesn't diminish from the power of the ending, in which Stryker activates a machine that only hurts mutants, and in the process finds out that his second-in-command is one. It's fiction, so it might be too convenient, one might say, but it doesn't make it any less realistic, as the world is a melting pot and everyone tends to be a mix of multiple things on all sorts of spectrums, racial, sexual, and otherwise. Anyway, Stryker kills her, and the act is shown on TV, in some very fine comics-only execution. It's a noble justification, but it's also low-key disturbing to me. Stryker "was about to shoot an unarmed little girl." That's what sways him. It's not that Stryker was calling for genocide to begin with, or that he was decrying the humanity of the blue elf-like dude. It's that Stryker threatened someone who looked like a regular innocent teenage girl. But it's also what makes it realistic. The comic closes with Professor X and the X-Men turning down Magneto's offer to join them, and a poignant closing exchange between the X-Men's traditional field leaders: Cyclops and Storm. "That's what it's all about, really," says Cyclops. "Needing and helping. Caring for one another." "And from that caring comes love," replies Storm. "Which makes the world go round." And then Storm undercuts the idealism of their musings with one line: "If only that were so." There's the way the world is supposed to work, the way superheroes represent. And then the acceptance that no, that's not how it works at all. Or to put it another way, God loves. Man kills.